It reminds me of that dreaded phone call, when I was told that both my parents were killed in a car accident. What does it look like to be the great lover of your life? To make love with your life? We never know when our final hour will come, but we can KNOW and LOVE the life that we’re living right now in the moment. What do you desire for your life to become? What do you think your life desires for YOU to become? Life is worthy of our LOVE. We must pursue and care for our lives. Are you the carrier of life, or is life the carrier of you? WE are the carriers of LIFE, and we MUST love it well! The one within us…the one that IS us. Then we can relate with the one outside of us. The life that sits in before us called, “today.” The life that’s in front of us. How well are you loving your life? 1. Love your body well. 2. Love your day well. 3. Love your life’s work well. What are you doing with the time you’re spending on planet earth? Time is life, and how you spend your time is how you spend your life. Are you loving it well? When you love your life well, your life will love you back. Write your LIFE a LOVE LETTER. Address your day/life with love. Thank you for being here, and allowing me to sip on life with you. 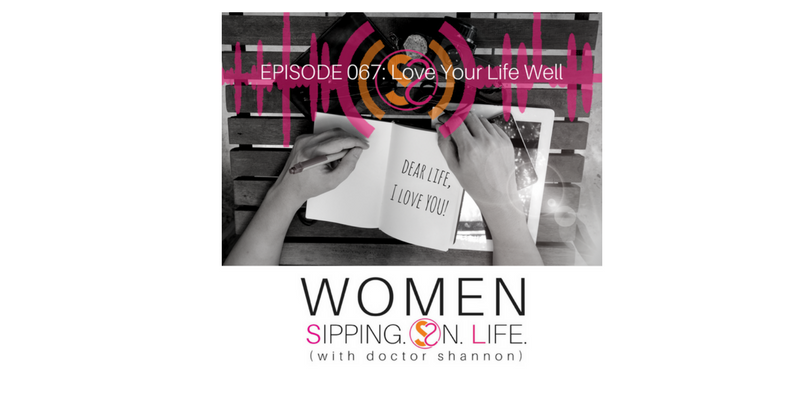 Please come over to WomenSippingOnLife.com for some free resources, including my Six Sacred S.O.L. DATE Secrets…and a FREE copy of my best-selling book, Date Yourself Well. You can also check out my Dr. Shannon Facebook Page for more daily S.O.L. TRAINING.